From cats and dogs and birds and squirrels and goats and turtles to llamas, sheep, cows, chickens, bears and elephants, hippos, rhinos, even giraffes, frogs and fish – all have mothers. Whimsical illustrations of animals, insects, reptiles, as well as people, bring home the message that everyone has a mother. The idea is amusingly stated in rhyme to delight any small child and honor any mother. Over 30 happy and colorful illustrations dance across the pages. Everyone Has a Mother is a sweet story about animals and their mothers. Amanda enjoyed how there were all kinds of animals, from giraffes that are tall, to fish that are small, to some having tails like whales, and how leopards have spots and ladybugs have polka dots. I liked the friendly colors and I enjoyed the bits that rhymed. 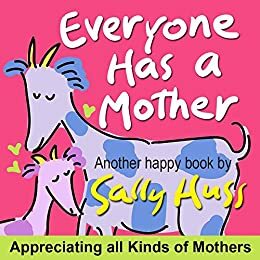 I thought it was clever at the end to describe all the different kinds of human mothers from foster mothers to great-grandmothers. This is a cute picture book for young children. "Bright and happy," "light and whimsical" have been the catch phrases attached to the writing and art of Sally Huss for over 30 years. Sweet images dance across all of Sally's creations, whether in the form of children's books, paintings, wallpaper, ceramics, baby bibs, greeting cards, purses, clothing, or her King Features Syndicated newspaper panel "Happy Musings." Before graduating from USC with a degree in Fine Art in the 60's, Sally had already become a champion tennis player, having won the Wimbledon and U.S. Junior titles and been a Wimbledon semi-finalist in the Women's Division in both singles and doubles. Through her tennis connections she ended up working in television for Ralph Story, and then in film for Samuel Goldwyn, Jr. Eventually, she transitioned into running Paul Simon’s music publishing company, Charing Cross in Beverly Hills. Keeping her hands on her tennis rackets, along with her brushes and pen, Sally operated in two arenas. Through her work with dance therapist Joan Englander, Sally created a unique method of playing and teaching tennis based on relaxation. It was highly embraced by creative people of all kinds and her roster of students included: Larry Hagman, Joel Grey, Barbra Streisand, Jill St. John, Helen Reddy, Milos Forman, Jack Jones. She eventually wrote a book on this “Zen-like” approach published by Harcourt, Brace. With her husband Marv Huss, former head of Advertising and Promotion for Hallmark Cards, they developed the renowned Aspen Club in Colorado, a luxury health spa and tennis facility, opening the club with a Battle of the Sexes match, pitting Sally against the self-proclaimed ultimate chauvinist Bobby Riggs. She was one of the first female head tennis club professionals in the U.S. Returning to California in the 80’s, the Husses embarked on building a string of 26 Sally Huss Galleries across the country (also one in Switzerland and another in Tokyo) offering Sally's art, writings, and licensed products. Through the galleries, Sally's creations have found their way into millions of offices, hotels, and homes, including those of Clint Eastwood, Kirk Douglas, Joel Gray, Bill and Hillary Clinton, and Mitt Romney. Sally has also been inducted into the Kern County Sports Hall of Fame and the Occidental College’s Sports Hall of Fame. Presently the Husses reside in Solana Beach, California and Sally continues to play social and league tennis nearby at the La Jolla Beach and Tennis Club. Besides this, Sally indulges herself in her life-long passion of writing and illustrating her own books. 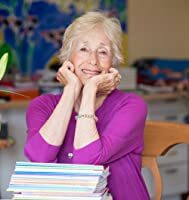 Her collection of books now numbers over 80 and many have become top-sellers on Amazon. The majority of her books are for children, while others touch on her expertise as a tennis champion, and still others reveal her positive philosophy of life. Her creations are still "bright and happy, "light and whimsical" after all these years! Disclosure: I grabbed a copy from Amazon Kindle when it was for free. This is my honest review. Please Note: The price was correct at the time of posting. Please check as the price can change.